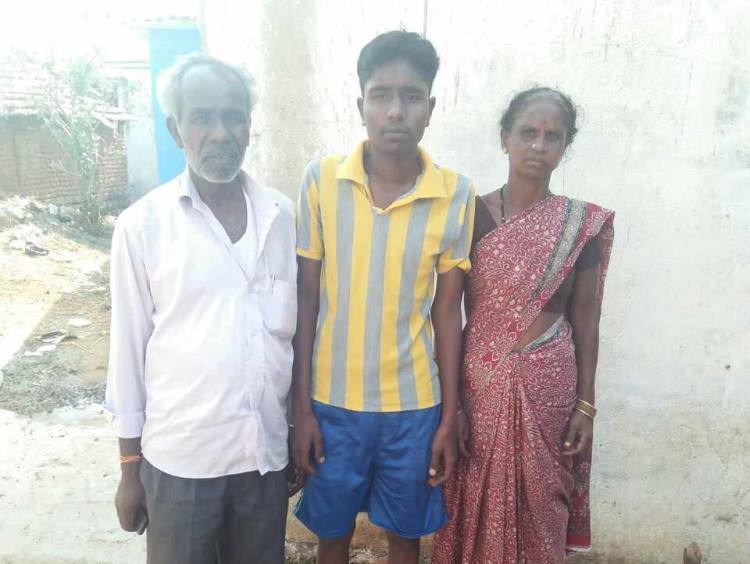 Srinivasalu, now 16, has been suffering from a severe heart disease for the past 8 years. But his father, Subramanyam, could never pay for his treatment. His condition just kept getting worse. Last month when he started getting breathless, Subramanyam took him to the hospital again. 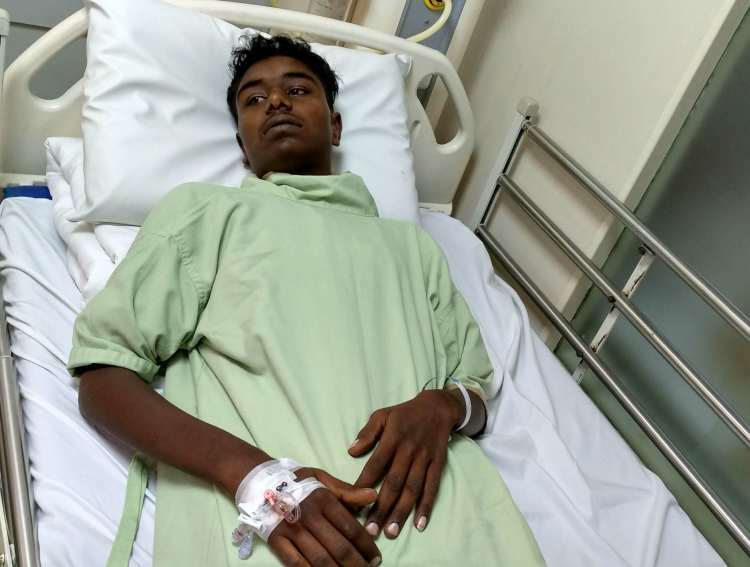 Srinivasalu’s condition has deteriorated so much that he needs a surgery at the earliest, to survive. Srinivasalu was in class 3, when one afternoon after school he started vomiting after lunch. They initially thought it was food poisoning, but he continued to throw up frequently over the next five days and got severely dehydrated. No medicine worked on him and his distraught parents took him to the doctor again. A series of tests showed that Srinivasalu had Tetralogy of Fallot - multiple heart defects that needed an open heart surgery to fix. 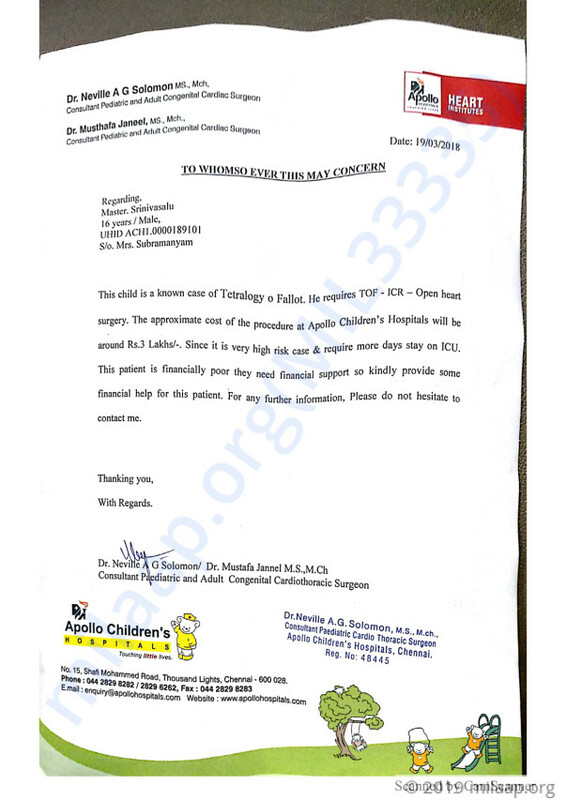 Subramanyam and his wife, Uma, were shocked to discover that their little boy had such a severe condition. From then, they have spent every day living in fear that their son will not survive. They had no means whatsoever to pay for his treatment. And no parent can silently watch as their child’s life is slowly slipping away. They were desperate to save him. The started to look for different medical health camps. It was only at camps that they could get free check-ups done. They attended every health camp in their village Kuppam, got him tested every time and purchased prescribed medicines. 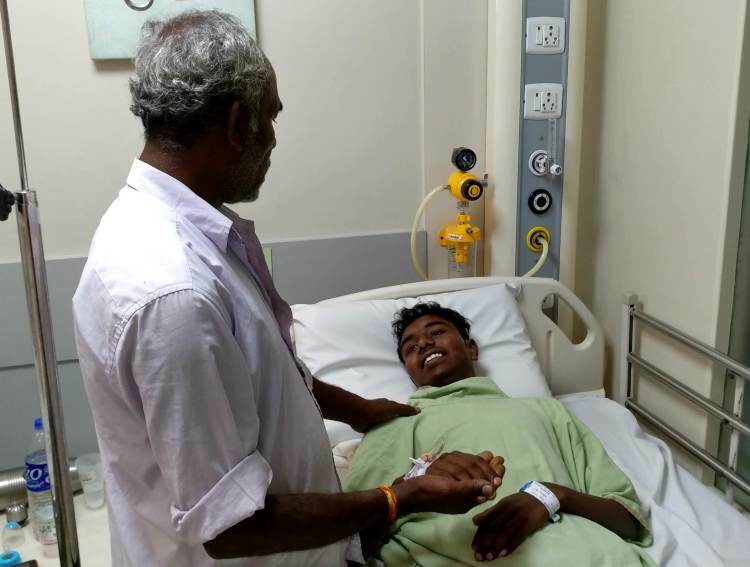 Medicines were all Subramanyam could afford on his own, in order to keep his son alive. This went on until Srinivasalu’s condition became very serious. 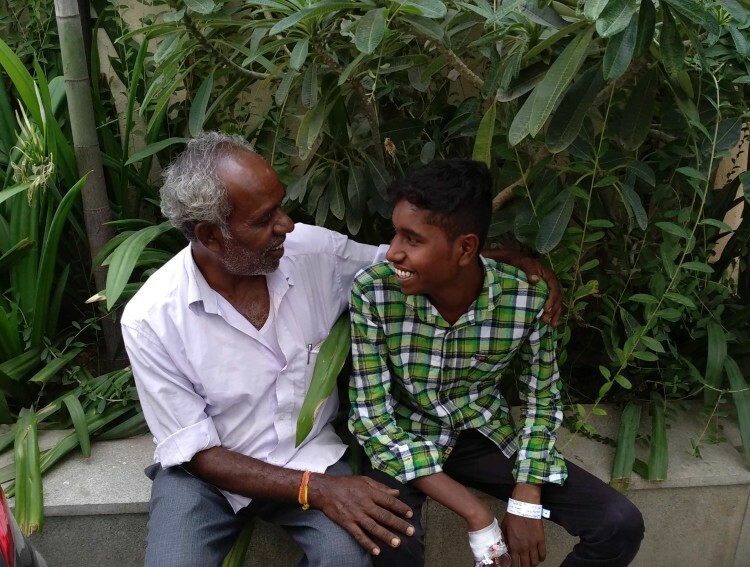 When Srinivasalu started getting breathless last month, the doctors at the hospital told the parents that he doesn’t have very long to live unless he gets a surgery done. He was hospitalized for 5 days, but the surgery couldn’t happen because of his high BP. He was prescribed medication again and then discharged. 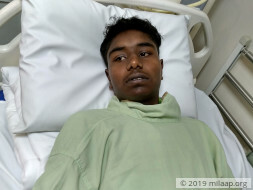 Once his BP is stable, he will have to undergo an operation, and his parents don't have any way to arrange the money needed. Subramanyam works as a seasonal daily wage laborer whose income is barely enough to keep the household afloat. His elder son, Sanjay, works as a salesman in a clothes shop while pursuing his degree to help out with the finances. But even that money isn’t enough to pay the hospital bills. 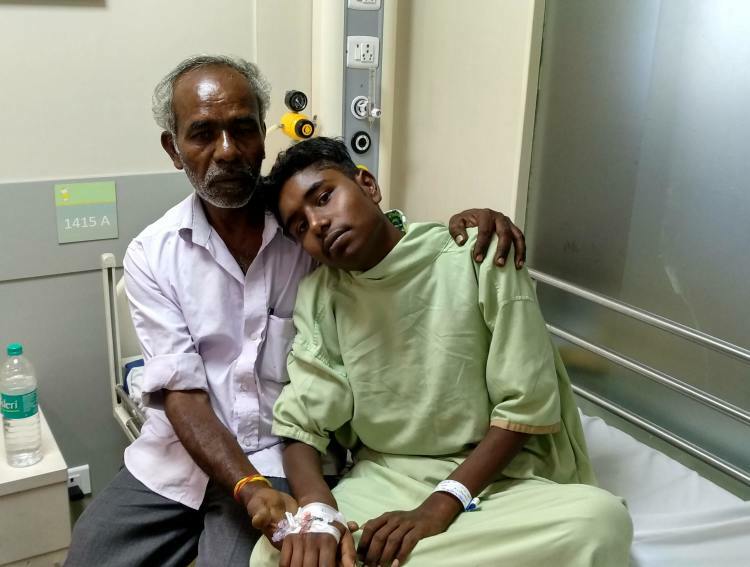 To help his son live, he needs your help. His poverty shouldn't be the cause of his son's untimely death. He needs Rs 3 lakhs for the treatment and he is running out of time. Your contribution can save Srinivasalu. It gives us immense pleasure in informing you all that Srinivasalu is now doing well and successfully underwent the surgery. He is responding well to the treatment administered to him. He is advised rest for six months post which he can resume schooling. We are all extremely thrilled to see him recovering. Thank you everyone once again! God bless you I wish you a speedy recovery and Successful surgery.